My last post certainly stirred up some interesting discussion! I really wish that I could have come up with a snarky reply. But I was literally speechless. And that is odd, because usually I’m pretty good with a quick come-back. But I will have the last laugh (sort of). The person who asked if knitting was a nervous habit is the wife of a colleague. They are expecting a baby in November. I will be kitting for them — they’re having a girl, and girl’s things are so fun. And I have quite awhile to come up with something snarky to say when they open the present. Maybe… It can be a productive nervious habit, can’t it? 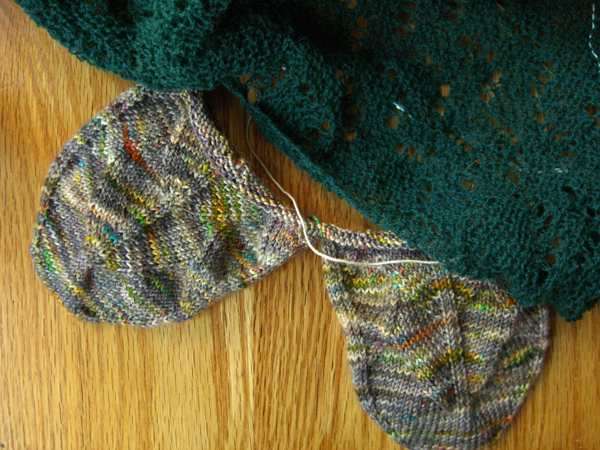 The Dragon Scale socks are progressing. You can see that I’m almost up to the gussets and there’s a couple of rows of overlapping scales now. Sheila asks: Whatâ€™s driven me to (finally) comment is that perfectly round toe on the dragon scales sock!! OMG. Is that a virtue of knitting on circulars? The picture shows the socks not stretched over a blocker. Still a fairly nice roundish toe. But maybe not quite as round as the picture from the last post. Last weekend I went to see Harry Potter and the Order of the Phoenix I liked it. A lot. I thought it an excellent example of how to condense a weighty and wordy tomb into the most germane portions for film. There were a few things left out that I thought should have been included. But on the whole it was a good job. Dark. Very dark. Maybe too scary for really small kids. My copy is already on order. Guess what I will be doing this weekend?